Basta Pasta--this was Anna Kate's suggestion for dinner. In Manhattan, 37 W.17th Street, back in mid-July on a very warm night. A mixed bag of dinner partners: her mom; her friend Matt (our son); Matt and Anna Kate's friend and associate at Ogilvy, Jake; Mike and me. It's discordant, to say the least, walking into what appears to be yet another Japanese restaurant/sushi bar deal. Seated, we glance at the menu. Wait. What? This is an Italian place? Seriously? Yes. Seriously. Where they make spaghetti carbonara and toss it in a half wheel of Parmesan Reggiano before serving. You just want to pass out, it's so good. 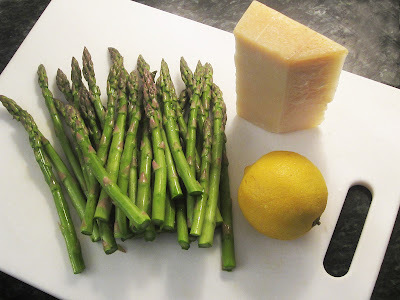 So Anna Kate and her mom were making appetizer suggestions right and left, and one of the things that landed on the table was an order of asparagi gratinati. Yeah, OK whatever. Well, it turned out to be one of the hits of the night. It's simple--asparagus al dente, with parmesan crusted on top and a squeeze of lemon. How hard can that be? For me, way hard. 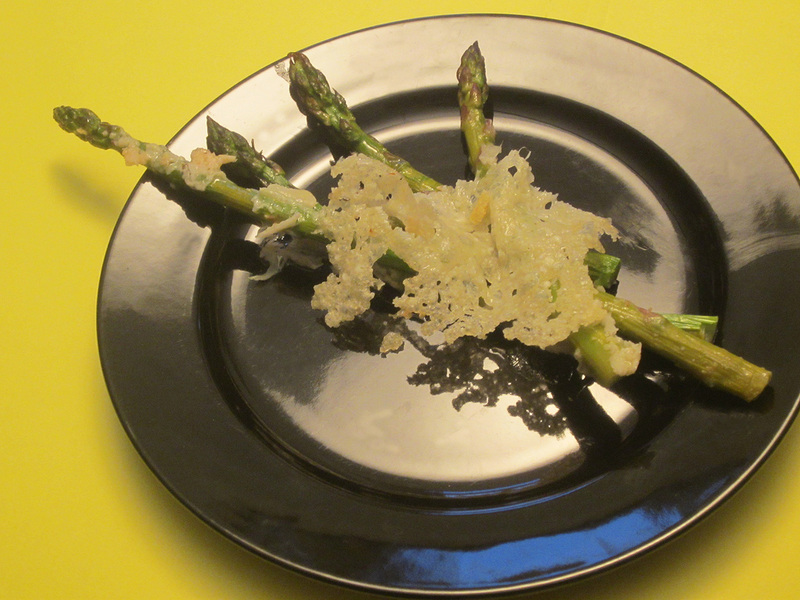 First attempt, roasted the asparagus far beyond al dente. Second time, put the lemon juice on before cooking. No, silly. Asparagus gets mushy. Third time's the charm. Perfecto. The Japanese would be proud. 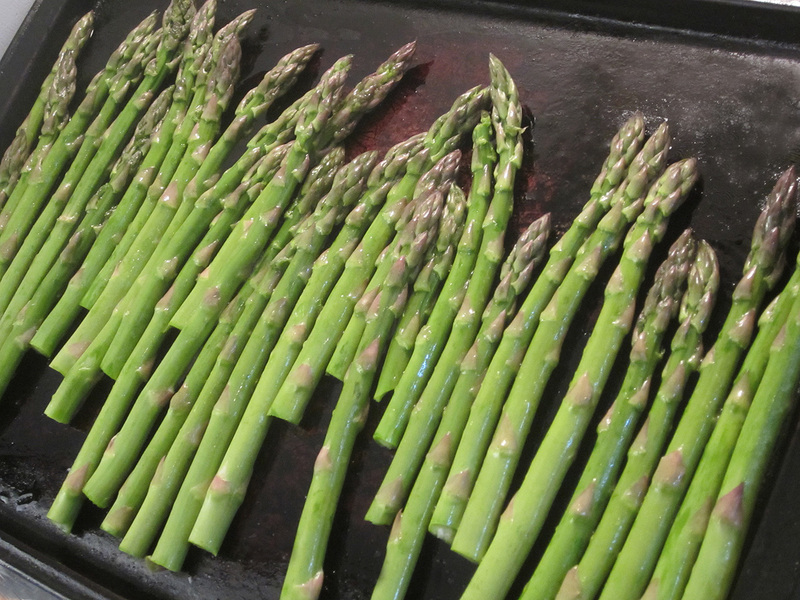 Preheat the oven to 425 F. Wash asparagus, pat dry with paper towel. Toss in small amount olive oil, place on cooking sheet. Roast on top shelf in oven maybe 8 minutes. Remove. Sprinkle grated parmesan (use the big holes on the grater) and run under the broiler until crusty. Remove, squeeze lemon and a sprinkle of salt on top. Suggested soundtrack: John Mayer's "Gravity." Mayer's awesome. Right, Nick?